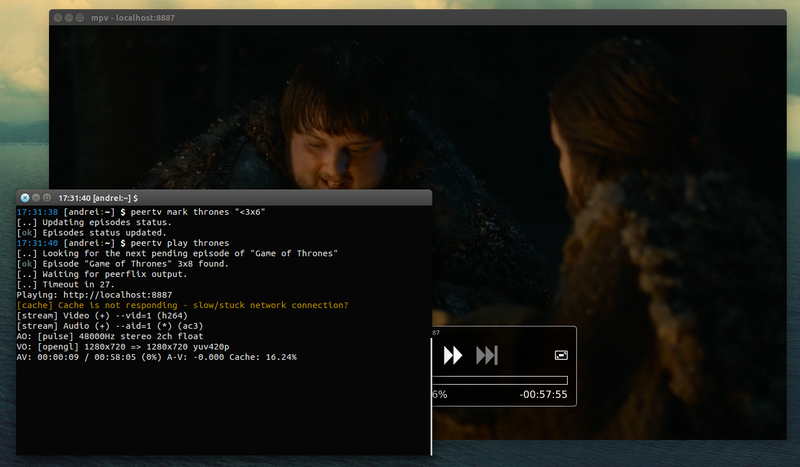 PeerTV is a command line tool for manage and play TV series from EZTV.it. It uses Peerflix to stream the torrents and by default, the videos are played with mpv, but that can be changed from the PeerTV configuration file. 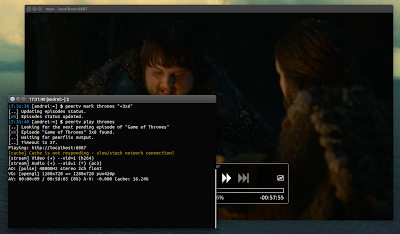 For those not familiar with Peerflix, this is a an experimental video streaming BitTorrent client for Node.js which can be used to stream video torrents via command line and play the stream with your favorite video player, such as VLC or MPlayer. PeerTV allows you to easily keep track of your watched / unwatched episodes: each viewed episode is automatically marked as seen and you can manually mark/unmark episodes as viewed - and of course, you play them with the help of Peerflix, with subtitles support. For downloading subtitles, PeerTV uses subliminal, a Python library and command line tool which supports subtitle websites such as Addic7ed, OpenSubtitles, Podnapisi, TheSubDB and TvSubtitles. Important note: PeerTV uses Peerflix to stream TV shows from torrents and that may be illegal in your country. Use at your own risk! 1. PeerTV depends on bash, sed, wget, rt, sqlite3, peerflix, mpv (or some other video player), and optionally: subliminal and notify-send. 2. You'll also need Peerflix - for how to install Peerflix, see THIS article. You can also download PeerTV manually from HERE. Arch Linux users can install PeerTV via AUR. Modify these configuration options to suit your needs - as you can see, here you can set the video player to use for playing TV episodes (but, depending on the video player you set, you'll also need to change the other "MPLAYER_" options! ), port (for instance, I already had something running on port 8888 so I had to change it to 8887 to get PeerTV to work), and so on. For the commands below, I'll use "Game of Thrones" with the "thrones" shortname as an example - replace these with the TV shows you want to add. More examples, etc. available at PeerTV's Gitorious page.